Most English-speaking visitors to the Dominican Republic never set eyes on the country’s capital, perhaps arriving on the island via a flight to Punta Cana airport, which is larger than Santo Domingo Las Americas Airport (SDQ), and spending a week at a all-inclusive resort. They are missing out. Although it does not fit most travelers’ vision of the DR — there are no city beaches, a lot of traffic, and everyday life is far removed from the idyll remove of a resort hotel — Santo Domingo is a vibrant and, in parts, beautiful city, and well worth a visit, even if only for a day. The largest city in the Caribbean, Santo Domingo has a rich history. It was the first major city of the Spanish New World, and many colonial buildings are still standing in the beautiful Zona Colonial (colonial zone). Later wealth as a sugar producer is evident in the hotels and buildings along the charming waterfront Avenida George Washington, better known as El Malecon. These areas are also the site of the city’s best and most-recommended Santo Domingo hotels. Navigating Santo Domingo can be fraught with difficulty. The city’s traffic laws are notoriously lax (red lights are treated as warnings only), and the drivers are by necessity bold and risk-taking. 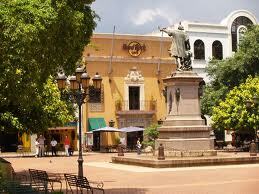 A guide or guided trip is recommended, though much of the UNESCO World Heritage site Zona Colonial can be seen by foot. The city is also not without its slums and bad sections, although tourist-friendly areas are generally safe and crime-free for precautious travelers. Dominican girls in Santo Domingo: some of the world's prettiest.